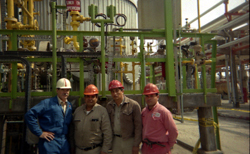 Above, Dan Banks with Pemex Refinery Operators - starting large Claus Sulfur Plant Off-Gas Incinerator. Callidus Technologies design at Tula, Mexico. 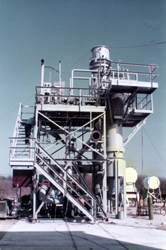 Chlorinated Silane Incinerator System - pre-shipment checkout. Unit was shipped to Oregon after partial disassembly. 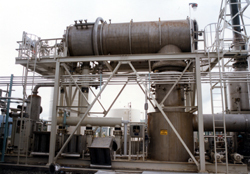 Above, Chlorinated Waste Gas Incinerator System - Dan Banks Design. 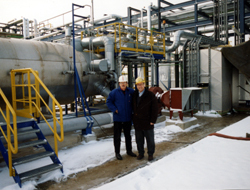 Carbon steel construction with Inconel waste gas hardware. Liquid Seal Flame Arrestor - Dan Banks design. Separate water circulating sprays to avoid fouling of demister internals. 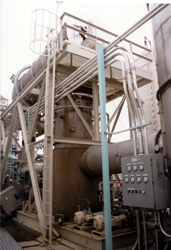 Geothermal Incinerator Flue Gas Quench System details - Dan Banks design. All 316 stainless due to SO2, SO3 in flue gas. 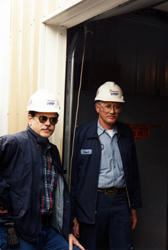 Dan Banks with wood treating plant Maintenance Manager - scrubber based odor control system. 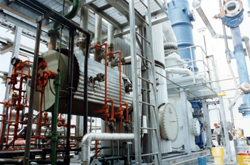 Geothermal Off Gas Incinerator System - Dan Banks Design. 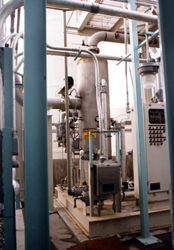 Horizontal elevated furnace with staged waste gas injectors visible at the left end.